The aggregation and deposition of amyloid-β (Aβ) peptides are believed to be central events in the pathogenesis of Alzheimer's disease (AD). Inoculation of brain homogenates containing Aβ aggregates into susceptible transgenic mice accelerated A? deposition, suggesting that Aβ aggregates are capable of self-propagation and hence might be prions. Recently, we demonstrated that Aβ deposition can be monitored in live mice using bioluminescence imaging (BLI). Here, we use BLI to probe the ability of Aβ aggregates to self-propagate following inoculation into bigenic mice. We report compelling evidence that Aβ aggregates are prions by demonstrating widespread cerebral β-amyloidosis induced by inoculation of either purified Aβ aggregates derived from brain or aggregates composed of synthetic Aβ. Although synthetic Aβ aggregates were sufficient to induce Aβ deposition in vivo, they exhibited lower specific biological activity compared with brain-derived Aβ aggregates. Our results create an experimental paradigm that should lead to identification of self-propagating Aβ conformations, which could represent novel targets for interrupting the spread of Aβ deposition in AD patients. Stöhr J, Watts JC, Mensinger ZL, et al. Purified and synthetic Alzheimer's amyloid beta (Aβ) prions. Proc Natl Acad Sci USA. 2012;109(27):11025-30. In Alzheimer's disease (AD), dementia severity correlates strongly with decreased synapse density in hippocampus and cortex. Numerous studies report that hippocampal long-term potentiation (LTP) can be inhibited by soluble oligomers of amyloid β-protein (Aβ), but the synaptic elements that mediate this effect remain unclear. We examined field EPSPs and whole-cell recordings in wild-type mouse hippocampal slices. Soluble Aβ oligomers from three distinct sources (cultured cells, AD cortex, or synthetic peptide, Aβ S26C dimers) inhibited LTP, and this was prevented by the selective NR2B inhibitors ifenprodil and Ro 25-6981. Soluble Aβ enhanced NR2B-mediated NMDA currents and extrasynaptic responses; these effects were mimicked by the glutamate reuptake inhibitor dl-threo-β-benzyloxyaspartic acid. Downstream, an Aβ-mediated rise in p38 mitogen-activated protein kinase (MAPK) activation was followed by downregulation of cAMP response element-binding protein, and LTP impairment was prevented by inhibitors of p38 MAPK or calpain. Thus, soluble Aβ oligomers at low nanomolar levels present in AD brain increase activation of extrasynaptic NR2B-containing receptors, thereby impairing synaptic plasticity. Li S, Jin M, Koeglsperger T, Shepardson N, Shankar G, Selkoe D. Soluble Aβ oligomers inhibit long-term potentiation through a mechanism involving excessive activation of extrasynaptic NR2B-containing NMDA receptors. The Journal of neuroscience? : the official journal of the Society for Neuroscience. 2011;31(18):6627-6638. doi:10.1523/JNEUROSCI.0203-11.2011. Alzheimer disease is a major cause of cognitive failure, and a pathogenically related but more subtle process accounts for many cases of mild memory symptoms in older humans. Insoluble fibrillar plaques of amyloid ?-proteins (A?) and neurofibrillary deposits of hyperphosphorylated tau proteins are the diagnostic lesions of AD, but their temporal mechanistic relationship has long been debated. The recent recognition that small, diffusible oligomers may be the principal bioactive form of A? raises the key question of whether these are sufficient to initiate cytoskeletal change and neurite degeneration. A few studies have examined the effects of oligomers of synthetic A? peptides of one defined length at supraphysiological concentrations, but the existence of such assemblies in the AD brain is not established. Here, we isolated A? dimers, the most abundant form of soluble oligomer detectable in the human brain, from the cortices of typical AD subjects and found that at subnanomolar concentrations, they first induced hyperphosphorylation of tau at AD-relevant epitopes in hippocampal neurons and then disrupted the microtubule cytoskeleton and caused neuritic degeneration, all in the absence of amyloid fibrils. Application of pure, synthetic dimers confirmed the effects of the natural AD dimers, although the former were far less potent. Knocking down endogenous tau fully prevented the neuritic changes, whereas overexpressing human tau accelerated them. Coadministering A? 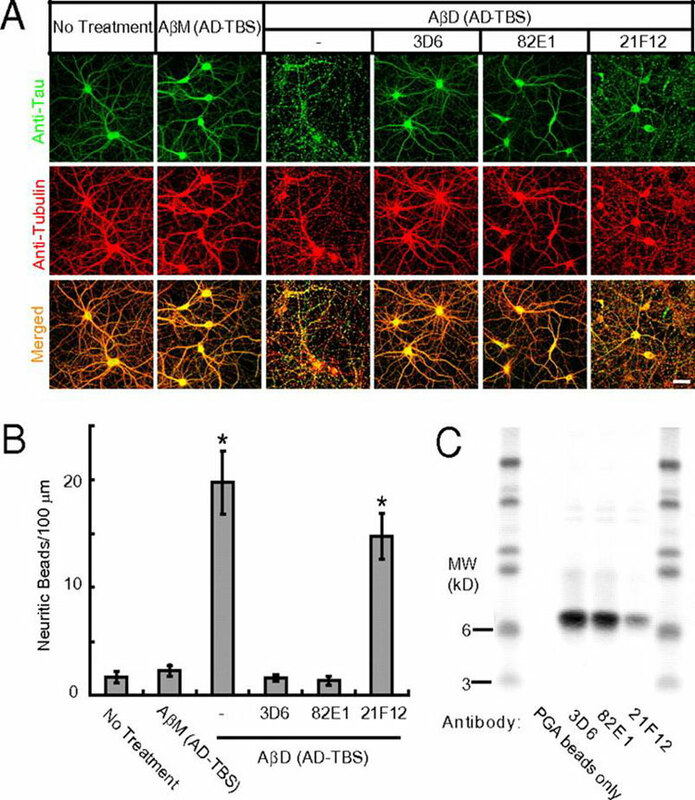 N-terminal antibodies neutralized the cytoskeletal disruption. We conclude that natural dimers isolated from the AD brain are sufficient to potently induce AD-type tau phosphorylation and then neuritic dystrophy, but passive immunotherapy mitigates this. Jin M, Shepardson N, Yang T, Chen G, Walsh D, Selkoe DJ. 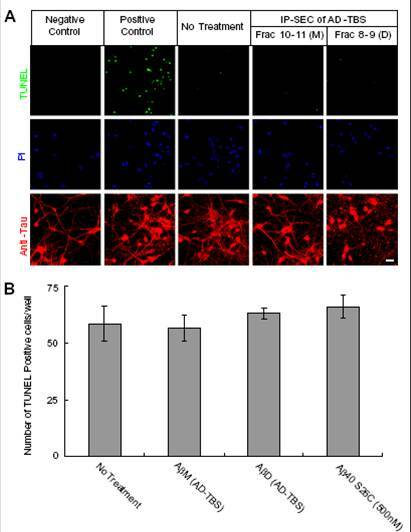 Soluble amyloid beta-protein dimers isolated from Alzheimer cortex directly induce Tau hyperphosphorylation and neuritic degeneration. Proc Natl Acad Sci USA. 2011;108(14):5819-24. Abeta dimers rapidly form stable synaptotoxic protofibrils. Non-fibrillar, water-soluble low-molecular weight assemblies of the amyloid β-protein (Aβ) are believed to play an important role in Alzheimer’s disease (AD). Aqueous extracts of human brain contain Aβ assemblies which migrate on SDS-PAGE and elute from size exclusion as dimers (~8 kDa) and can block long term potentiation and impair memory consolidation in the rat. Such species are detected specifically and sensitively in extracts of Alzheimer brain suggesting that SDS-stable dimers may be the basic building blocks of AD-associated synaptotoxic assemblies. Consequently, understanding the structure and properties of Aβ dimers is of great interest. In the absence of sufficient brain-derived dimer to facilitate biophysical analysis, we generated synthetic dimers designed to mimic the natural species. For this, Aβ(1-40) containing cysteine in place of serine 26 was used to produce disulphide cross-linked dimer, (AβS26C)2. Such dimers had no detectable secondary structure, produced an analytical ultracentrifugation (AUC) profile consistent for an ~8.6 kDa protein, and had no effect on hippocampal long term potentiation (LTP). However, (AβS26C)2 aggregated more rapidly than either AβS26C or wild type monomers and formed parastable β-sheet rich, thioflavin T positive, protofibril-like assemblies. 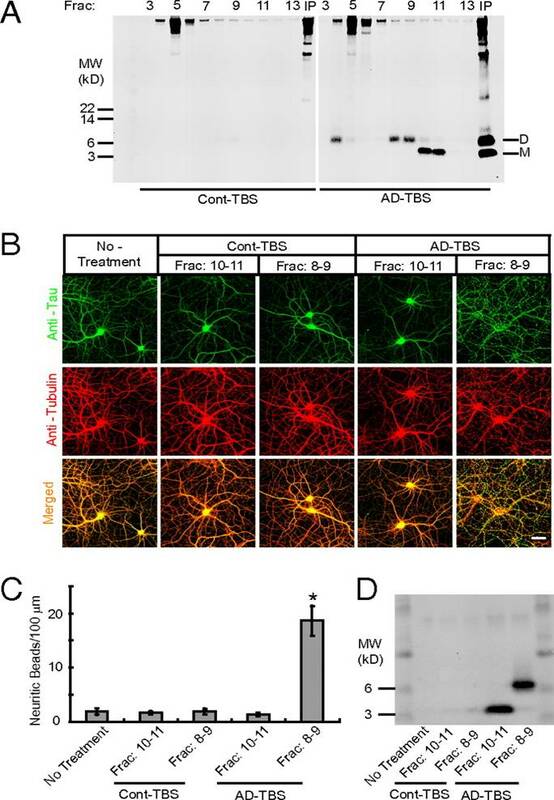 Whereas wild type Aβ aggregated to form typical amyloid fibrils, the protofibril-like structures formed by (AβS26C)2 persisted for prolonged periods and potently inhibited LTP in mouse hippocampus. These data support the idea that Aβ dimers may stabilize the formation of fibril intermediates by a process distinct from that available to Aβ monomer and that higher molecular weight pre-fibrillar assemblies are the proximate mediators of Aβ toxicity. O'nuallain B, Freir DB, Nicoll AJ, et al. Amyloid beta-protein dimers rapidly form stable synaptotoxic protofibrils. J Neurosci. 2010;30(43):14411-9. Amyloid-β protein dimers isolated directly from Alzheimer's brains impair synaptic plasticity and memory. Alzheimer's disease constitutes a rising threat to public health. Despite extensive research in cellular and animal models, identifying the pathogenic agent present in the human brain and showing that it confers key features of Alzheimer's disease has not been achieved. We extracted soluble amyloid-beta protein (Abeta) oligomers directly from the cerebral cortex of subjects with Alzheimer's disease. The oligomers potently inhibited long-term potentiation (LTP), enhanced long-term depression (LTD) and reduced dendritic spine density in normal rodent hippocampus. Soluble Abeta from Alzheimer's disease brain also disrupted the memory of a learned behavior in normal rats. These various effects were specifically attributable to Abeta dimers. Mechanistically, metabotropic glutamate receptors were required for the LTD enhancement, and N-methyl D-aspartate receptors were required for the spine loss. Co-administering antibodies to the Abeta N-terminus prevented the LTP and LTD deficits, whereas antibodies to the midregion or C-terminus were less effective. 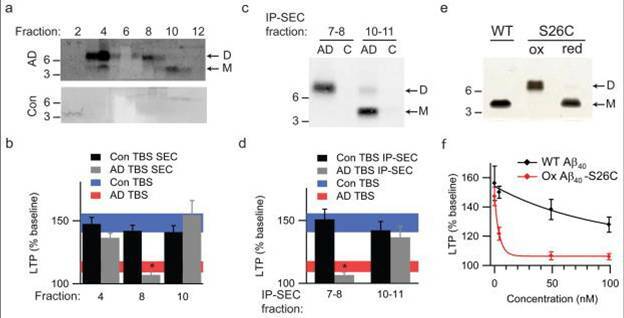 Insoluble amyloid plaque cores from Alzheimer's disease cortex did not impair LTP unless they were first solubilized to release Abeta dimers, suggesting that plaque cores are largely inactive but sequester Abeta dimers that are synaptotoxic. We conclude that soluble Abeta oligomers extracted from Alzheimer's disease brains potently impair synapse structure and function and that dimers are the smallest synaptotoxic species. (a) TBS extracts of AD (top panel) and control (bottom panel) brains were subjected to non-denaturing SEC. SEC fractions were lyophilized and WB’d with 2G3+21F12; molecular weights (in kDa) on left. Note that Aß monomer and dimer in the AD TBS extract is recovered from material that elutes at the end of the void volume (fractions 3/4). Control (Con) brain extracts were devoid of Aß. (b) Summary LTP data (means ± SEMs) for slices treated with SEC fractions from AD or Con TBS extracts (n=6 slices for all samples), as characterized in Fig. 3a. (c) Representative WB (2G3+21F12) of IP-SEC fractionation of AD TBS and Con TBS. TBS extracts (500 µL) were immunoprecipitated with 3D6 (3 µg/mL), eluted with sample buffer and subjected to SEC. Dimer-enriched (fractions 7–8) and monomer-enriched (fractions 10–11) IP-SEC fractions were separately pooled, as were corresponding fractions from Con TBS. (d) Summary LTP data (means ± SEMs) for slices treated with IP-SEC fractions of AD and control brain TBS extracts, as characterized in Fig. 3c (Con fractions 10–11, n=5; AD fractions 10–11, n=5; Con fractions 7–8, n=7; AD fractions 7–8, n=7). (e) Mutant Aß40-S26C forms dimers under oxidizing conditions (ox), which can be reduced to monomers by treating with ß-ME (red). Silver stain was performed with 100 ng wildtype Aß40 (wt) peptide or the mutant peptide (f) Summary LTP data (means ± SEMs) for slices treated with 5, 50, or 100 nM of either wt Aß40 (black) or oxidized Aß40-S26C (red) reveals that the oxidized Aß40-S26C dimer inhibits LTP with much greater potency (100 nM Aß40-S26C, n=4; n=5 for all other treatments). The vehicle controls (plotted at 0 nM) were 50 mM ammonium acetate (n=4) for the S26C peptide and 0.1% ammonium hydroxide (n=4) for wt peptide. Shankar GM, Li S, Mehta TH, et al. Amyloid-beta protein dimers isolated directly from Alzheimer's brains impair synaptic plasticity and memory. Nat Med. 2008;14(8):837-42. (A) AD-TBS (Right) or Cont-TBS (Left) was immunoprecipitated with antibody 3D6 and eluted with sample buffer containing 4% LDS, and subjected to SEC. SEC of the immunoprecipitaton of AD-TBS resolves Aß dimers (fractions 8–9) from monomers (fractions 10–11), as detected by Western blot with 6E10 + 2G3 + 21F12. IP, 3D6 immunoprecipitates of the starting Cont-TBS or AD-TBS extracts used for this SEC. (B) Confocal images showing the tau (green) and Tubulin (red) immunoreactivities of the cytoskeleton of hippocampal neurons [days in vitro (DIV) 21] after 3-d treatment with Aß monomers (SEC fractions 10–11) or Aß dimers (SEC fractions 8–9) isolated from AD-TBS or the corresponding fractions from Cont-TBS. (Scale bar, 50 µm.) (C) Histograms represent the average number of tau-positive beads along 100-µm lengths of Tubulin-positive neurites under different conditions. Asterisk indicates data significantly different from those of neurons without treatment (P < 0.01 by Student t test). Error bars, SEM. 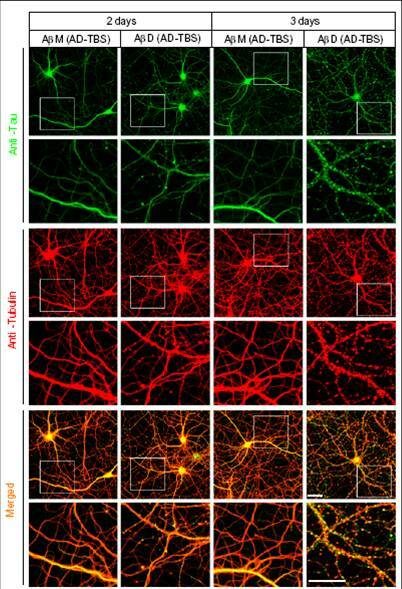 (D) After a 3-d incubation on primary neurons, the conditioned media were immunoprecipitated with Aß antiserum AW7. Aß monomers and dimers were precipitated from medium that contained the reconstituted IP-SEC fractions of AD-TBS but not from that with Cont-TBS. (A) Confocal images showing the tau (green) and microtubule (red) cytoskeleton of primary hippocampal neurons (DIV21) after 3 d treatment with AßM or AßD from AD-TBS with or without monoclonal antibodies (3D6, 82E1, or 21F12) against human Aß (each at 3 µg/mL). (Scale bar, 50 µm.) (B) Histograms represent the average number of tau-positive beads along 100-µm lengths of Tubulin-positive neurites under different conditions. Asterisks indicate data significantly different from those of neurons without treatment (P < 0.01 by Student t test). Error bars, SEM. 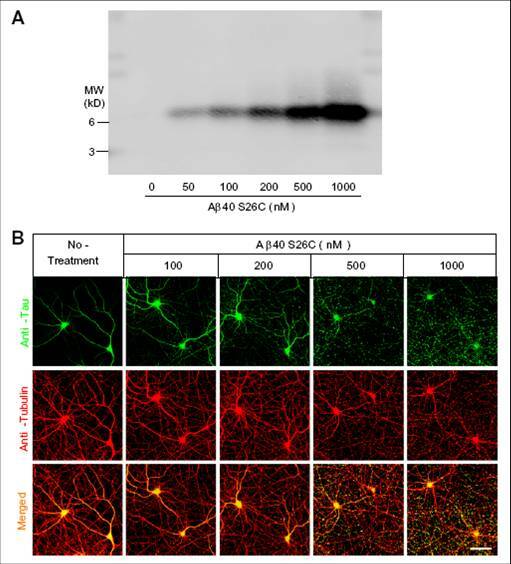 (C) Pull-down of the Aß dimers by PGA beads added to the conditioned media of the neurons after the 3-d treatment, as detected by Western blot with 6E10 + 2G3 + 21F12. Primary hippocampal neurons (DIV19) transduced with lentivirus encoding hTau-EYFP were treated under different conditions, as indicated in the key. Histograms represent the average levels of phosphorylation of human (h) or rat (r) tau at specific epitopes (AT8: Ser202/Ser205; 12E8: Ser262; AT270: Thr181; AT180: Ser231/Thr235; PHF-1: Ser396), normalized to the values in parallel cultures without treatment. Data are means of three independent experiments. Asterisks indicate data significantly different from those of neurons without treatment (P < 0.05 by paired Student t test). Error bars, SEM. (B) Histograms of the average numbers of TUNEL-positive cells in each well (~4 × 104 neurons) after the indicated treatments. Means from three independent experiments; error bars, SEM. (A) Western blotting of culture media (20 L) containing increasing concentration (nM) of crosslinked dimers of dimers of Aß 40-S26C. B) Confocal images showing the tau-reactive (green) and microtube-ractive (red) cytoskeleton of primary cultured hippocampal neurons (DIV21) after 3-day treatment with increasing concentrations of Aß 40-S26C dimers. (Scale bar, 50 m.) A minor degree of neuritic beading could be observed at Aß40-S26C dimer concentrations as low as 100 nM.